Sanjini has published three children's books and has fourteen more to publish. 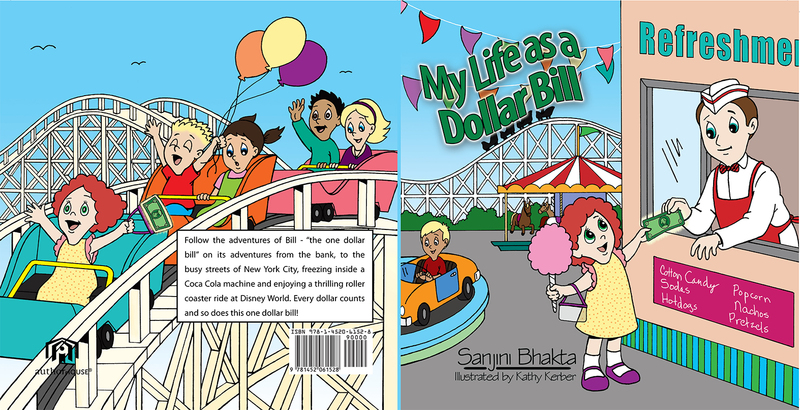 Follow the adventures of a dollar bill, from the streets of New City, freezing in a coca cola machine, having fun at Disney World and on an exciting roller coaster ride. Every dollar counts and so does this dollar bill! Follow the adventures a cute pony named "Chocolate" who gets lost one day. She loses sight of her Mom beyond the meadow and her adventures begin. She becomes the star of a pet zoo, the star of a circus where she performs pony tricks and lives a life of luxury with a little girl who adores her. Will she find her way back home to her Mom? Matilda is a big sow or pig who lives in Provence, France. She has a very big snout and is an expert at digging for truffle mushrooms which are the most expensive food in the world. This makes Matilda, the most valuable pig in the world! IN DIGITAL AND PRINTED FORMATS. Copyright © Sanjini, 2018. All rights reserved.